Last week I met with Ms. Jenn Harris who is the Founder and CEO of highheelgolfer. I recently joined a San Diego networking group called 6 Degrees. Jenn found me on their website after I joined and reached out to me since we both have “heels” of some sort in our company title. Jenn started golfing when she was 16 years old. By the age of 18 she was a 4 handicap…if you don’t know what that means, that is OK, I didn’t either. When she asked me what MY handicap was I said, “I have ADD and small eyes.” Apparently that’s not the right answer…but after I take her one-day workshop, I’m sure I’ll know what this term means and will be able to give a sound answer going forward. After graduating with a degree in marketing/psychology she went to work in Washington D.C. in defense contracting. Here is where she realized the value that golf can bring in the work environment. Jenn would spend hours in the office at work, but her true relationships and rapport with her co-workers was built during the hours she would spend on the golf course with them. About a year and a half into defense contracting, she realized she wasn’t cut out for a corporate or government job, and wanted to combine her love of golf and entrepreneur mentality. Jenn has always been a solution finder; she thrives off of finding a problem, creating a solution, and building a program to provide this solution. During her hours on the course with her co-workers and clients, she realized how much rapport is built, how much business can be done, and the kinds of things you learn in a few short hours about the person you are golfing with that could normally take YEARS to learn and establish. In todays dynamic of “people buy from those that teach, those they trust, and those they like,” the ability to golf with someone you are trying to build a solid relationship with can be invaluable. You learn things that might not ever be spoken, but are crucial during the beginning stages. Such as: how well do you observe proper etiquette? Are you responsible? How do you react in a stressful and tough situation? How creative are you when faced with a tough choice? I asked Jenn what she wanted to emphasize when it came to explaining what the participant will get out of her workshops. She said that there are three main things that make a great business golfer. I am getting people together for a workshop in either January or February in San Diego for a SOTGC event. 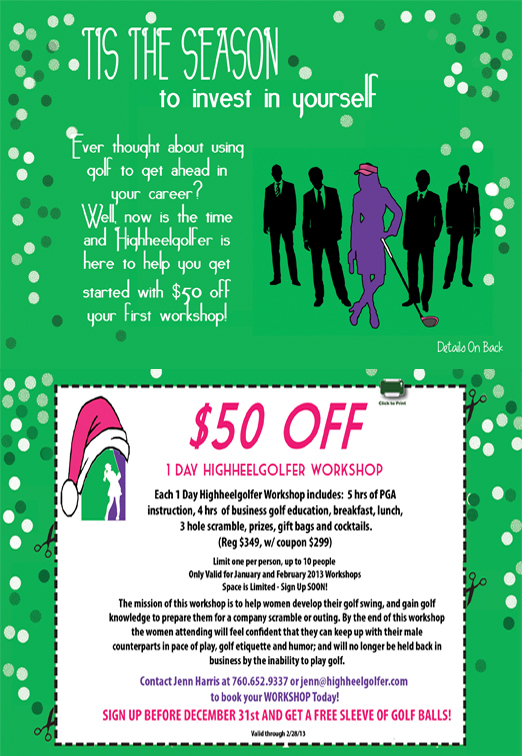 Jenn is giving us a special “SOTGC discounted price” for the workshop, and the day includes swag bags with highheelgolfer and SOTGC mementos. Please email me if you’d like to participate in this event: ceosotgc@gmail.com. If you are outside San Diego, but think this would be a great corporate or group event, Jenn is able to bring this workshop anywhere in the United States (with a 20 person minimum). I look forward to posting more on this wonderful concept as I believe strongly in the idea that so much can be accomplished in a few hours of golf, and that the ability to play a good/decent round of golf can open doors that otherwise might take years to crack. Jenn will also be giving us a “tip of the week” on business/golf that will post in the “Tea Time With Champagne” category. Fun Fact – According to the USGA (United States Golf Association), Fewer than 5% of Golfers Worldwide ever break 100, so don’t worry if you aren’t great at first, most people who play golf never get that good, they just love the game and the relationships they have gained through it.